Export MapPoint Waypoints for Excel (RouteWriter) is an Excel add-in designed to export travel route and waypoint data from Microsoft directly into Excel in structured format for analysis and integration. Route waypoints are exported to Excel in route order and can be cross referenced with pushpins with the pushpin information also exported. Export MapPoint Waypoints for Excel also includes the ability to import Excel route waypoint data back into MapPoint in a specified order enabling customized routes based on process requirements. Export MapPoint route pushpins to Excel or text files. 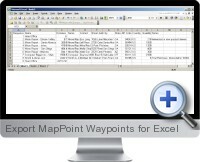 Maintains the route waypoint order in the Excel export. Export all associated data for each pushpin. Export addresses and coordinates for each waypoint. Ability to create and export rest breaks. Create routes from pushpins in a pre-defined order or from sub groups of pushpin sets. Works with all versions of Microsoft MapPoint from 2006 and above. Ability to output waypoint distances and times. Option to batch override waypoint stop times. Function to export the optimal waypoint order, instead of the existing one. Supports data with duplicate pushpin names. Sort pushpin data fields according to name, numeric or text fields in ascending or descending order. Import routes from Excel to MapPoint with added pushpins as start and end locations.